Here we have a smart, confident but not ostentatious piano. 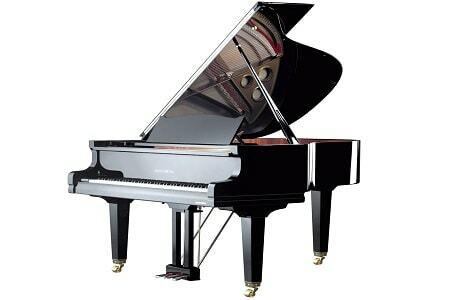 It is not for pianists who wish to impress with exotic woods and lavish brass fittings. This is in the truest sense a musicians’ piano; hit the keys and the sound hits one back! The Renner hammers are pretty resilient and for the working musician this allows a tonal range that never ends. Perfectly suited to the nuances and precision of the most elegant masterpieces, the rough and tumble of prickly jazz or the dense, solid, stolid richness of late-Romantic piano repertoire. For those interested in the technical details; the firm of August Förster has been producing pianos in the same factory for over 150 years, making it one of the oldest piano factories in the world. Every piano carries the BVK (German Piano Maker Association) accreditation and is individually built by hand. The action is by Renner and strings by Röslau. Ultimate tuning stability is guaranteed as each string has its own eye. The piano is for home use for those who know what is well made and value for money. Indeed, it is for those who do not need large corporate interests to intrude on their music making.